The high-and-mighty car market is small, and Mercedes intends to exploit every possible scrap, a strategy reinforced by the introduction of the AMG editions of the company’s range-topping CL-class coupe and S-class sedan. Like other offerings from the Mercedes in-house tuning shop, the CL63 and S63 add an extra measure of sporty character to a pair of cars that already rank among the best in the business. Unlike other AMG specials, though, the key difference isn’t a matter of extra muscle. There’s certainly plenty of that—518 horsepower, 465 pound-feet of torque, thanks to a new 6.2-liter V-8, an engine designed, developed, and produced in-house by AMG. 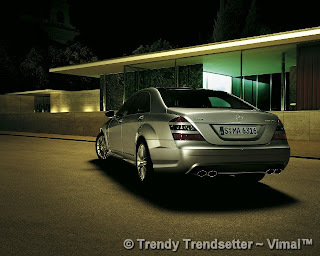 But the 5.5-liter twin-turbo V-12 of the CL600 and S600 almost matches the horsepower of the V-8, trumps its torque with a prodigious 612 pound-feet, and likely beats the straight-ahead hustle of the CL63 and S63 by a small margin, even though Mercedes estimates a 0-to-60-mph time of 4.5 seconds for all of them. That’s pretty quick for cars weighing well over two tons. But what sets these AMG editions apart is a level of athleticism and nifty footwork that’s absent in their more mainstream counterparts. This shows up in a near-total absence of body roll in hard cornering, and quicker responses in a series of linked turns—mountain switchbacks, for example. AMG achieved this partly by employing harder suspension bushings, a time-honored tuning trick, but mostly by retuning the computer-controlled profile of the ABC active suspension system, which is pure 21st century. Sticky Yokohama tires lend extra grip and high-speed stability, oversize brakes exploit the added adhesion, and AMG-specific bucket seats lend a much higher level of lateral support. But the most instantly tangible element in the AMG editions is steering that clearly communicates with the driver, a striking contrast with the lifeless helms of the other CL- and S-class offerings. With most Mercedes-Benz models, the AMG massage makes the subject vehicle the most expensive member of a particular model line. And that’s still true for the 604-hp CL65 and S65 AMG versions which cost almost $200,000. But these second AMG offerings in the CL- and S-class replace the old supercharged CL55 and S55 and maintain their relative price positioning below the CL600 and S600. Those prices are expected to start at about $130,000 for the CL63 and $126,000 for the S63 when they go on sale in June. Does that sound like a lot of money? Maybe. But it’s less than the CL600 and S600. Bargains sometimes come in very fancy packags.